A pulmonary embolism is a potentially life-threatening condition that often occurs after the development of deep vein thrombosis. A blood clot will travel to the lungs from a person’s leg. Life-threatening problems can arise when the blood clots get lodged in the small veins in the lungs. In the U.S., there are 350,000 cases of pulmonary embolism every year, resulting in up to 85,000 deaths. In a new study published in the journal Medicine & Science in Sports & Exercise, Spanish researchers found that basketball players may have an increased risk of pulmonary embolism compared to the general population. 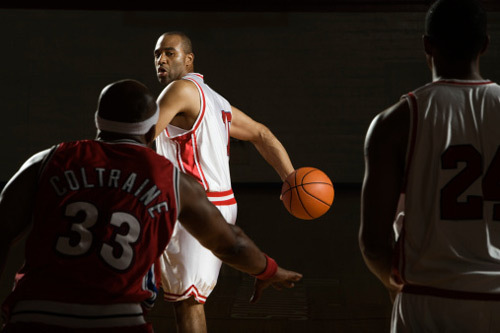 For the study, researchers reviewed articles on pulmonary embolism among professional and amateur basketball players during the 2010/2011 season and 2014/2015 season. The objective of the researchers was to compare previous studies of pulmonary embolism in women and men and same-age counterparts of the general population. The comparison included 25- to 35-year-olds in Norway and Minnesota, which were the only two available locations in the general population where embolism rates had occurred. The athletes from the study were from two major basketball leagues: the Basketball Clubs Association (BCA)—also known as the Association de Clubes de Baloncesto (ACB)—in Spain and the National Basketball Association (NBA) in the U.S. The study focused on six total pulmonary embolism cases detected in the BCA and the NBA. Researchers discovered that the rates of pulmonary embolisms among basketball players produce 2.06 cases per thousand for the BCA and 1.27 per thousand for NBA players. Rates in the general young adult population were 0.1 per thousand in Minnesota and 0.018 per thousand in Norway. The most notable NBA player with a pulmonary embolism is power forward Chris Bosh of the Miami Heat. The 10-time NBA all-star had complained of shooting pains and shortness of breath and was hospitalized for a pulmonary embolism in his left lung. Former Brooklyn Nets guard Mirza Teletovic had been diagnosed and treated for blood clots in his lungs during January of 2015. Bosh and Teletovic both missed the rest of the 2014/2015 season after being treated with the condition. Cleveland Cavaliers center Anderson Varejao also suffered a pulmonary embolism in the 2012/2013 season. Former NBA player Jerome Kersey had reportedly died in February from lung blood clots. Other athletes known to suffer a pulmonary embolism include Women’s Tennis Association superstar Serena Williams, Olympic speed skater Rebekah Bradford, and former National Hockey League goaltender Tomas Vokoun. The symptoms most commonly associated with pulmonary embolism include chest pain, irregular heartbeat, difficulty breathing, coughing, and coughing up blood. Potential causes of pulmonary embolism include damage to blood vessel walls, an increased number of red blood cells, smoking, certain medications, cancer, and surgery. There are several reasons that connect highly conditioned athletes with pulmonary embolism. Inactivity before and after sports competitions can contribute to the risk of deep vein thrombosis. In other words, the longer you don’t move on a plane or other form of transportation can increase the risk of blood clots developing in your leg veins. Dehydration can also increase blood thickness, which increases chances of blood clotting. Broken bones and other sports injuries can lead to immobility, which allows for blood to pool and can lead to clotting. Study authors state that results need to be replicated in larger studies: “We have shown there is limited evidence of higher risk, so more research is needed, however, our research should serve to warn the basketball community about the possible risk,” explained lead study author Marti Casals, who is a member of the Public Health Agency of Barcelona and the National Research Center Network for Epidemiology and Public Health. Casals, M., et al., “Do Basketball Players Have a High Risk of Pulmonary Embolism? A Scoping Review,” Medicine & Science in Sports & Exercise 2015, doi: 10.1249/MSS.000000000000780. Neumann, J., “Basketball players may be at heightened risk of lung clots,” Reuters web site, October 30, 2015; http://www.reuters.com/article/2015/10/30/us-health-athletes-pulmonary-embolism-idUSKCN0SO2DM20151030. “Athletes vulnerable to blood clot condition that may affect Chris Bosh,” PalmBeachPost.com, February 20, 2015; http://www.palmbeachpost.com/news/sports/basketball/athletes-vulnerable-to-blood-clot-condition-that-m/nkFyB/. Tapson, V.F., “Pulmonary Embolism (PE),” Merck Manual Professional Version web site, http://www.merckmanuals.com/professional/pulmonary-disorders/pulmonary-embolism-pe/pulmonary-embolism-pe, last accessed November 2, 2015. Wdro, B., “Pulmonary Embolism (Blood Clot in the Lung),” MedicineNet.com, http://www.medicinenet.com/pulmonary_embolism/article.htm, last accessed November 2, 2015.